Welcome to the analysis of 2001: A Space Odyssey. Buttons at the bottom of each post enable navigation through the parts of the analysis. You may want to view the table of contents. Regarding the appearance of possible anti-Semitism on this blog, please see the 'Disclaimers' section near the bottom of this page. The contents of the analysis of 2001 on this blog are identical, to those of the analysis of the movie on the Can Analyze Kubrick blog, except that there are a few additional posts in this analysis that are not contained in the other one, most of which have to do with hints for interpreting A Space Odyssey, from some of the films of Quentin Tarantino. 2001: A Space Odyssey is a 1968 epic science fiction film produced and directed by Stanley Kubrick, and co-written by Kubrick and Arthur C. Clarke. The story deals with a series of encounters between humans and mysterious black monoliths that are apparently affecting human destiny, and a space voyage to Jupiter tracing a signal emitted by one such monolith found on the moon. Keir Dullea and Gary Lockwood star as the two astronauts on this voyage, with Douglas Rain as the voice of the sentient computer HAL, who seems human and has almost full control over their spaceship. The film consists of four major sections, all of which, except the second, are introduced by superimposed titles. Above left: A tribe of our ape-like early ancestors, encounters the monolith for the first time. Top right: The leader of the tribe of ape-men discovers how to use a bone as a weapon. Above left and right: The match cut from bone to orbiting weapons satellite. A Pan Am space plane carries Dr. Heywood R. Floyd (played by William Sylvester) to a space station orbiting Earth for a layover on his trip to Clavius Base, a U.S. outpost on the moon. The Pan Am space plane carrying Heywood Floyd. 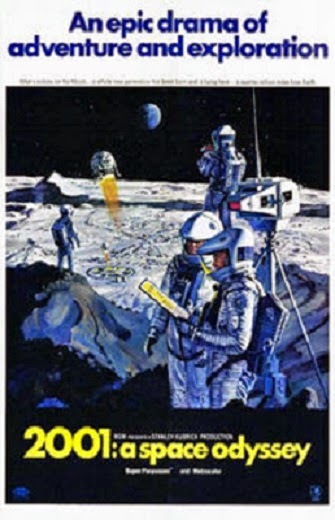 After making a videophone call from the station to his daughter (Vivian Kubrick), Floyd encounters his friend Elena (Margaret Tyzack), a Russian scientist, and her colleague Dr. Smyslov (Leonard Rossiter), who asks Floyd about odd things occurring at Clavius, and the rumor of a mysterious epidemic at the base. The American firmly declines to answer any questions about the supposed epidemic. Dr. Smyslov (seated at left) questions Heywood Floyd (center) about the supposed epidemic at Clavius base. Elena is seated at right. Floyd then travels from the space station, to Clavius base on the moon. At Clavius, Floyd heads a meeting of base personnel, apologizing for the epidemic cover story but stressing the need for secrecy. His mission is to investigate a recently found artifact — "Tycho Magnetic Anomaly One" (TMA-1) — according to Floyd, deliberately buried four million years ago. Floyd and some other men ride in a moonbus to the artifact, a black monolith identical to the one encountered by the apes. The men (six total individuals, including Floyd) examine the monolith, and pose for a photo in front of it. While doing so, they hear a very loud high-pitched noise, presumably coming from the monolith. The six astronauts descend into the excavation at TMA-1, where a monolith has been sighted. Eighteen months later, the American spaceship Discovery One is bound for Jupiter. On board are mission pilots and scientists Dr. David Bowman (Keir Dullea) and Dr. Frank Poole (Gary Lockwood), and three other scientists who are in cryogenic hibernation. "HAL" (voiced by Douglas Rain) is the ship's HAL 9000 computer, which runs most of Discovery One's operations. While Bowman and Poole watch HAL and themselves being interviewed in a BBC show about the mission, the computer states that he is "foolproof and incapable of error." HAL also speaks of his enthusiasm for the mission, and how he enjoys working with humans. When asked by the host if HAL has genuine emotions, Bowman replies that he appears to, but that the truth is unknown. Above left: The Discovery One spaceship as viewed from the front right side. Above right: Discovery One from the rear right. Top left: Discovery One astronaut David Bowman converses with mission computer HAL. Top right: HAL's camera 'eye'. Above left: Bowman's fellow astronaut, Frank Poole, watches a BBC broadcast about his and Bowman's mission to Jupiter. Above right: Two of the three astronauts who are in hibernation. HAL asks Bowman about the unusual mystery and secrecy surrounding the mission, but interrupts himself to report the imminent failure of a device which controls the ship's communications antenna. After retrieving the component with an EVA pod, the astronauts cannot find anything wrong with it. HAL suggests reinstalling the (supposedly) defective unit and letting it fail so the problem can be found. Above left: Bowman (wearing a red spacesuit) has exited his EVA pod, and is here shown approaching Discovery One's communications antenna. Above right: Bowman removes the (supposedly) defective device from the antenna assembly. As will be described later in the analysis, it is evident that this device, known as an AE-35 unit, controls the positioning of the communications antenna. Note the replacement unit sitting to Bowman's right - we are never shown the replacement unit being installed; this fact will come into play later in the analysis. Mission control concurs with HAL's suggestion (to reinstall the (supposedly) defective unit), but advises the astronauts that results from their twin HAL 9000 indicate the ship's HAL is in error predicting the fault. When queried, HAL insists that the problem, like all previous issues with the HAL series, is due to "human error." Concerned about HAL's behavior, Bowman and Poole enter one of the EVA pods to talk without the computer overhearing them. They both have a bad feeling about HAL, despite the HAL series' perfect reliability, but decide to follow his suggestion to replace the unit. As the astronauts agree to deactivate the computer if it is proven to be wrong, they are unaware that HAL is reading their lips through the pod's window. Top left: Poole and Bowman converse inside an EVA pod (which is located in the pod bay aboard Discovery One), about their doubts regarding HAL. Note the window in the pod. Top right: HAL, whose camera 'eye' is visible in the distance, can see through the pod window. HAL cannot hear the two men talking, however, since the pod door is shut and the pod itself is sealed, and the men have deactivated all the electronic devices which might enable HAL to hear them. Above left and right: A view from HAL's perspective, of Poole's and Bowman's lips moving, as visible through the window just mentioned. As becomes evident later in the movie, HAL knows the contents of the two men's conversation from reading their lips. After Poole exits Discovery One to reinstall the (supposedly) defective AE-35, Poole's EVA pod (below left screencap), controlled by HAL, moves toward Poole and then hits him, severing his oxygen hose and setting him adrift in space (below right). Bowman, not realizing the computer is responsible for Poole's being set adrift, takes another pod to attempt a rescue, leaving his helmet behind. While he is gone, HAL terminates the life functions of the three crew members in suspended animation (below left). When Bowman returns to the ship with Poole's body, HAL refuses to let him in, stating that he cannot allow the mission to be jeopardized. Bowman manually opens the ship's emergency airlock and bodily enters the ship (below right), risking death from lack of oxygen. After donning a helmet, Bowman proceeds to HAL 9000's memory core intent on disconnecting the computer. HAL first tries to reassure Dave, then pleads with him to stop, and finally begins to express fear. Dave ignores him and disconnects each of the computer's memory modules. HAL eventually regresses to his earliest programmed memory, the song "Daisy Bell", which he sings for Bowman. When the computer is finally disconnected, a pre-recorded video message from Floyd plays. In it, he reveals the existence of the four million-year-old black monolith on the moon. Floyd says that it has remained completely inert, except for a single, very powerful radio emission aimed at Jupiter, and then adds that the monolith's origin and purpose is "still a total mystery." Near Jupiter, Bowman leaves Discovery One in an EVA pod and finds another monolith in orbit around the planet (as shown at left). Approaching this monolith, Bowman's pod is suddenly pulled into a tunnel of colored light, and a disoriented and terrified Bowman finds himself racing at great speed across vast distances of space, viewing bizarre cosmological phenomena and strange landscapes of unusual colors. He finds himself, older and still in his spacesuit, standing in a room appointed in the Louis XVI-style. Bowman sees progressively older versions of himself, his point of view switching each time, alternately appearing sitting at a table eating, and finally as a very elderly man lying in a bed. A black monolith appears at the foot of the bed, and as Bowman gestures toward it with his right arm and hand, he is transformed into a fetus-like being enclosed in a transparent orb of light. The new being floats in space beside the Earth, gazing at it. Top left: Bowman sees this image while moving through space (i.e., through the 'stargate') at a high rate of speed. Top right: An aged Bowman sitting at a dining table, in a Louis XVI-style room. Above left: Bowman gestures toward the monolith from his bed. Above right: The fetus in an orb of light, floating near Earth. One thing we will be doing in this analysis, is looking at hints given to us to help unlock the meaning of Kubrick's movie, in the films of other movie-makers, such as those of Quentin Tarantino, Michael Mann, David Lynch, and the creators of the Hannibal Lecter films. a. Poster for 2001: A Space Odyssey: The poster art copyright is believed to belong to the distributor of the film, Metro-Goldwyn-Mayer (Turner Entertainment), the publisher of the film or the graphic artist. Further details: 2001: A SPACE ODYSSEY © 1968 Turner Entertainment Co. An epic drama of adventure and exploration (film poster). b. Wikipedia, '2001: A Space Odyssey (film)'. Web, n.d. URL = https://en.wikipedia.org/wiki/2001:_A_Space_Odyssey_(film). c. The orbiting object is a nuclear weapons satellite: The Making of Kubrick's 2001. Ed. Jerome Agel. Signet, 1970. p. 196 and caption in photographs section.